During his visit from July 25 to July 27 to Nyingchi, Shannan, and Lhasa, Li talked with officials and residents, learning about local economic and social development, and extending his good wishes to people of all ethnic groups in Tibet. In a village of Nyingchi, where residents enjoy better housing and more incomes thanks to poverty alleviation programs, Li said development is key to increasing people's wealth and achieving prosperity in Tibet. People's livelihood should be improved through sustainable development, which should be based on actual conditions of Tibet, he said. At the confluence of the Yarlung Zangbo River and its tributary Nyang River, Li was briefed on the conservation of water resources and eco-system. He said that the Qinghai-Tibet Plateau is the "water tower" of China and Asia, where ecological conservation should be strengthened to support sustainable development in the whole country. At present, infrastructure development in the country's central and western regions is relatively weak, and promoting effective investments to improve weak links will not only narrow the gap in regional development but also helpful for the country to cope with economic downturn, he said. At Tibet Autonomous Region People's Hospital in Lhasa, Li said that the government will step up support to hospitals in Tibet and colleges for traditional Tibetan medicine to meet the needs of local residents. In Lhasa, Li also interacted with young makers at a startup base. The premier said entrepreneurship and innovation in Tibet are very important to high-quality growth. The country will create better environment to support the education of skilled workers and train more talented workers that are in high demand. While visiting Jokhang Temple, a renowned temple for Tibetan Buddhism in Lhasa, Li said Tibet has been an inalienable part of China ever since ancient times and he hoped that religious circles will continue to make contributions in safeguarding national unity and promoting ethnic solidarity as well as social harmony. At the Potala Palace, a UNESCO world heritage site, Li said that the government will step up support for the research on precious documents and push cultural inheritance and exchanges. 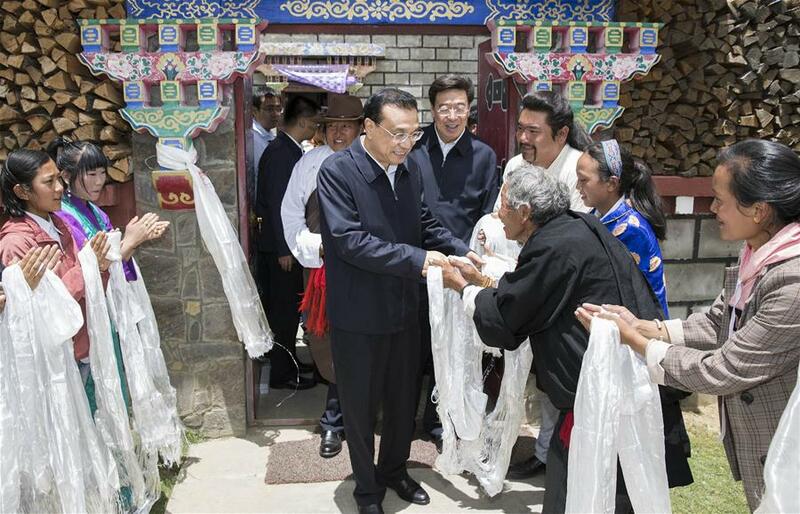 Li expressed the hope that Tibet can stick to strategies and policies of the Communist Party of China to achieve development and prosperity, safeguard national unity, enhance solidarity among ethnic groups, promote social and economic development, and maintain lasting peace and stability in Tibet.